Ho Hum, another year, and Michael's still Sleeping. As what a Horrific way to celebrate your 49th birthday; SHEISA! 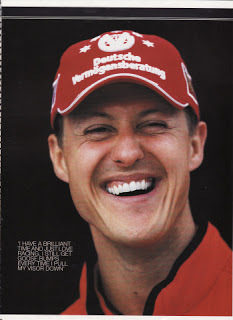 As won't bother trying to recap any of the last few years bluster over Michael's getting Better from such luminaries as Ross Brawn, Jean Todt, etc. Whilst all of my racing "related" Space Travel talk found me recallin' that 'Ol Schue and his Bosom Buddy Rubino' had both purchased flights into Space aboard Sir Richard Branson's Virgin Galactic Wayback when., along with Niki Lauda. As Thars' NO word on whether or not 'Ol Niki-the-Rat was gonna sit in-between Michael and his ex-Scuderia Ferrari sparrin' pardner' Rubens Barrichello? So another year's slipped away, and nothing new to report upon 'DER TERMINATOR's condition. As I totally understand the Family's wish towards respectable privacy, what baffles me is the almost virtual "white Noise" coming from the total lack of any News at all upon Michael's current health situation. Instead, the latest Schumacher "Camp" news is all about his 20yr old daughter Gina Maria's horse riding exploits and her boyfriend, who Oh My Gawd! Kissed her on the forehead & lips in public; Ooh la-lah Mon Cherie! And then there's his 18yr old son Mick's blossoming single seater racing career. As Mick Jnr's just completed his first season of the vaunted FIA Formula 3 European Championship for Prima Powerteam in 2017, and presumably is planning on another season's Euro F3 campaign in 2018, albeit he's not currently listed on Prima's entries denoted next year. Not to mention that Mick drove his father's ex-Benetton B194 racecar at last year's Belgian Grand Prix to honour the 25th Anniversary of Poppa's maiden Grands Prix victory, appropriately being scored on the Driver's-Driver's track, the Mighty Spa Francorchamps! Whilst I believe I've scribbled previously here on No Fenders, how is I-T just Mwah? Or is the irony of Lewis Hamilton finally breaking one of Michael's records, occurred of all places at Monza, Italy. Y'all know la Scuderia's Home track where Hamilton, aboard his Silver Arrows, nee Mercedes scored his 69th career Pole position! thus eclipsing Michael's leading tally of 68. As Lewis closed out the 2017 Formula 1 season with a total of 72 career Poles to his name, and counting. Along with his Mega' haul of 62 first place trophies and four World Championships. The 32yr old Brit' is definitely in range of eclipsing another of Schuey's records, i.e. ; 91 Grands Prix victories, albeit I'd like to think that numbers untouchable, Eh?